Maintaining your currency is required to fly. 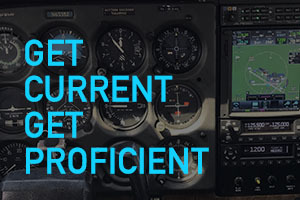 Developing proficiency and your skill is the right way to fly. We can help with both. Confidence is gained when you are proficient, knowledgable and skillful in your flying. Don't let a few years out of the saddle keep you from flying. Just schedule a few sessions with our instructors to get you back in the sky with updated skills and improved knowledge. We'll brief you on updated rules and regulations, focus on skills you feel you need the most help with and provide a relaxing environment for you to learn in. There's no rush and our flexible scheduling and no-nonsense pricing means you can get flying again for less than you might imagine. A requirement for all pilots, your two-year flight review can be accomplished with on of our experienced flight instructors. You can expect 2-3 hours total with about half dedicated to ground review and half to practical flying skills. You may wish to schedule more than one flight to make sure you are prepared for your review. You may also consider scheduling a quarterly flight with one of our instructors to help sharpen your skills and make your biennial review as smooth as mild winter flying. Our flight instructors can help you with your proficiency check to keep your instrument rating current or catch up if you've let it lapse. Expect around 3 hours for your review and flight time "under the hood". Want to make sure you don't need a proficiency check? Just maintain your currency by scheduling a short quarterly flight with 3 approaches each with our qualified flight instructors acting as safety pilots. You may also consider a longer flight semiannually, but don't wait until the last minute when scheduling, weather, aircraft or other factors can derail you: call a month in advance to make sure you have time to review, fly and stay current. You earned your certificate to fly, so maintain your currency by scheduling regular flights by either renting our aircraft or taking an instructor along and gain some skills and tips along the way. It is an old adage that pilots never stop learning, so keep those skills up to date with a flight instructor dedicated to helping you fly safely. It's easy to get started, just call (916) 427-7707 or send us a message to schedule your review, training or proficiency check. Make it a goal to fly safely in more situations: take your proficiency check at night to sharpen those night flying skills and log your landings in night conditions. A cool way to fly, maintaining currency at night keeps you current to carry passengers (with the appropriate certificate) in both conditions!